Director Michael Bay (2nd L) attends. CHICAGO – This 25-image slideshow contains red carpet photos from the Tokyo premiere of “Transformers: Revenge of the Fallen”. Celebrities in attendance include Megan Fox, Shia LaBeouf, Tyrese Gibson, Josh Duhamel, Michael Bay, Ramon Rodriguez, and Isabel Lucas. The film opens on June 24th, 2009. You can click “Next” and “Previous” to scan through this slideshow or jump directly to individual photos with the captioned links below. Photos credited to Kiyoshi Ota/ Getty Images for Paramount Pictures. All Rights Reserved. Transformers_Tokyo_01: Actress Megan Fox signs autographs for fans. Transformers_Tokyo_02: Actor Tyrese Gibson poses for photographs upon his arrival. Transformers_Tokyo_03: Director Michael Bay signs autographs for fans. Transformers_Tokyo_04: Actor Ramon Rodriguez poses for photographs upon his arrival. Transformers_Tokyo_05: Actor Shia LaBeouf signs autographs for fans. Transformers_Tokyo_06: Actor Shia LaBeouf signs autographs for fans. Transformers_Tokyo_07: Actor Josh Duhamel poses for photographs upon his arrival. Transformers_Tokyo_08: Actress Megan Fox blows a kiss as she poses for photographs upon her arrival. Transformers_Tokyo_09: Director Michael Bay (L) and actor Shia LaBeouf pose for photographs upon their arrival . Transformers_Tokyo_10: Actress Isabel Lucas poses for photographs upon her arrival. Transformers_Tokyo_11: Actress Megan Fox attends. Transformers_Tokyo_12: Director Michael Bay (2nd L) attends. Transformers_Tokyo_13: (Front L-R) Actress Megan Fox, director Michael Bay and actor Shia LaBeouf and (Back L-R) actor Ramon Rodriguez, actor Josh Duhamel, actor Tyrese Gibson and actress Isabel Lucas pose for photographs with a large model of the Autobot Bumblebee. Transformers_Tokyo_14: (Front L-R) Actress Megan Fox, director Michael Bay and actor Shia LaBeouf and (Back L-R) actor Ramon Rodriguez, actor Josh Duhamel, actor Tyrese Gibson and actress Isabel Lucas pose for photographs with a large model of the Autobot Bumblebee. Transformers_Tokyo_15: Actor Tyrese Gibson attends. 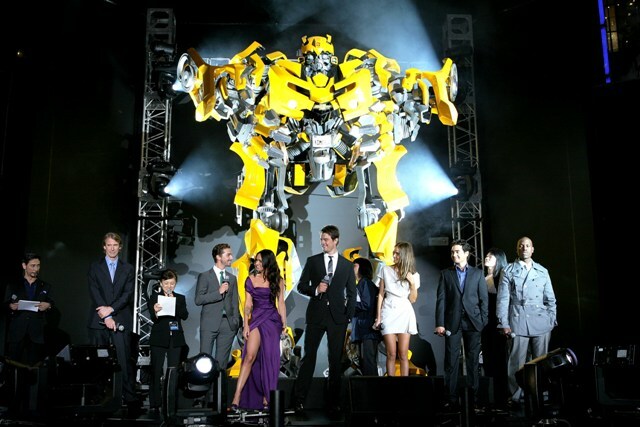 Transformers_Tokyo_16: (Front L-R) Actress Megan Fox, director Michael Bay and actor Shia LaBeouf and (Back L-R) actor Ramon Rodriguez, actor Josh Duhamel, actor Tyrese Gibson and actress Isabel Lucas pose for photographs with a large model of the Autobot Bumblebee. Transformers_Tokyo_17: Director Michael Bay attends. Transformers_Tokyo_18: Actress Isabel Lucas attends. Transformers_Tokyo_19: Actor Ramon Rodriguez attends. Transformers_Tokyo_20: (L-R) Director Michael Bay, actor Shia LaBeouf and actress Megan Fox attend. Transformers_Tokyo_21: Actor Josh Duhamel attends. Transformers_Tokyo_22: Actor Shia LaBeouf attends . Transformers_Tokyo_23: Actor Shia LaBeouf (L) and actress Megan Fox attend. Transformers_Tokyo_24: (Front L-R) Actress Megan Fox, director Michael Bay and actor Shia LaBeouf and (Back L-R) actor Ramon Rodriguez, actor Josh Duhamel, actor Tyrese Gibson and actress Isabel Lucas pose for photographs with a large model of the Autobot Bumblebee. Transformers_Tokyo_25: A large model of the Autobot Bumblebee is displayed.